Property Location Located in New Braunfels, Quality Inn and Suites New Braunfels is close to New Braunfels MarketPlace and Schlitterbahn Waterpark. 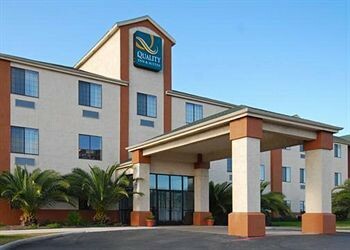 This hotel is within close proximity of Christus Santa Rosa Hospital New Braunfels and Gruene Hall.Rooms Make yourself at home in one of the 69 guestrooms. Complimentary wireless Internet access keeps you connected, and satellite programming is available for your entertainment. Bathrooms have complimentary toiletries and hair dryers. Conveniences include desks and coffee/tea makers, as well as phones with free local calls.Rec, Spa, Premium Amenities Don’t miss out on the many recreational opportunities, including an indoor pool, a spa tub, and a fitness center.Dining A complimentary buffet breakfast is included.Business, Other Amenities Featured amenities include a business center, complimentary newspapers in the lobby, and laundry facilities. Planning an event in New Braunfels? This hotel has facilities measuring 1640 square feet (148 square meters), including conference space. Free self parking is available onsite.